Miami University Press, 9781881163565, 112pp. Poetry. 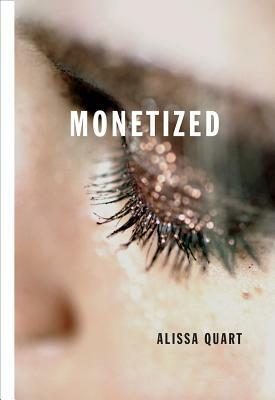 Alissa Quart's first book of poetry sifts brilliantly through our landscape of damaged Americana. From spam ads to tech speak, from self-help to real estate to the lingo of gossip or "mom" sites, these poems insistently limn a country where nearly everything has taken on the character of money. Quart, the acclaimed author of Branded and two other books of reported cultural criticism, cuts into our clamorous culture, summoning its strangeness and humor. MONETIZED also reflects upon a shared longing for the analogue era, as well as our longing for a less commercialized past. This book is a remarkable account of a state of yearning for the passing moment in a period of rapid acceleration, a feeling Quart calls "right-now-nostalgia." "It's pretty unusual, it's almost unheard of, for poems to feature both the subtlest and most intricate word play and a pure, fierce, tell-it-like-it-is voice, as these poems do. They are stealthily virtuosic." Louis Menand.